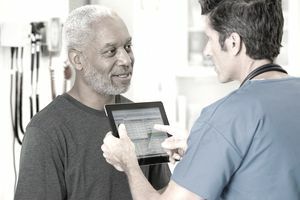 Whether you read about the late enrollment penalty for Medicare of you experienced it first-hand, it seems a little mind-boggling that the federal government would penalize you for not taking advantage of a service. If you’re not enrolled, the government isn’t taking on the cost of your coverage. You would think they would welcome such an arrangement and maybe even pay you, but no—if you don’t enroll when you’re supposed to, you will owe a penalty. If you’re already collecting Social Security, either retirement or disability benefits, you will automatically be enrolled in Parts A and B. The Part B premium will be deducted from your monthly Social Security benefit check. If you have to sign up, the first time you can enroll is called your initial enrollment period. This is the time when you should sign up for Parts A and B, also known as Original Medicare. The initial enrollment period normally begins three months before the month you turn 65, includes the month you turn 65, and ends three months after the month you turn 65. If you’re still working and receive coverage from your employer, you can tell Medicare that you’re already covered under an employer-sponsored plan. This will save you from having to pay an enrollment penalty but also not require you to pay the Part B monthly benefit. In general, it’s best to stay on your employer-sponsored plan. You don’t have to sign up for Part C, also known as a Medicare supplement, but Original Medicare has some coverage gaps that could leave you with very large medical bills that you’re unable to pay. You should consider signing up for Part C coverage when Medicare becomes your primary insurer. If you’re still receiving health insurance from another source, Part C coverage probably isn’t necessary yet. You are required to have some sort of prescription drug coverage, but it doesn’t have to be through a Part D plan. If you have prescription drug coverage through your current employer, you don’t need a plan from Medicare or other private insurers. Now that we know when and what you must have, what happens if you don’t comply and have to pay a late enrollment penalty? How much are the penalties? Part A: You might see a 10 percent increase in your premium if you pay a premium for Part A. You will pay the higher premium for twice the number of years you weren’t enrolled. If you should have been enrolled two years ago, you have to pay the penalty fee for four years. Most people don’t pay for Part A and are automatically enrolled so there’s usually nothing to worry about here. Part B: Be careful with Part B. The penalty is 10 percent for each 12-month period you should have been enrolled. Example: If your initial enrollment period ended July 31, 2015, and you waited until August 2 of 2017 to enroll, your premium will go up 20 percent. And you have to pay the penalty fee plus your normal premium for the rest of your life. Part D: This penalty requires some complicated math to figure out. If you don’t meet one of the four requirements above for a period of two years, you’ll pay approximately $11 per month as a penalty as long as you have Part D coverage. If you don’t agree with the fee, Medicare has a way to file an appeal with the appropriate forms. It might seem kind of mean to charge a fee, but it makes sense. In order to keep costs as low as possible, Medicare relies on healthy people paying into the system to make up for the costs that are paid out for the unhealthy. If Medicare allowed people to enroll later, when their health starts to degrade, the costs to everybody would be significantly higher.